We may be quieting down on this issue after re-arranging the cage. I don’t know that I see her swelling up with another egg inside. She’s in good spirits, and loves to see me and have a chat. She has this naked patch down her breast where the feathered have been removed, but she’s not sensitive about it. There are 10 dummy eggs in her dish. All the shells on the ones I’m removed have been solid, so I’m glad I’ve got her on a good diet. I don’t recall where I had heard about Harrison’s. 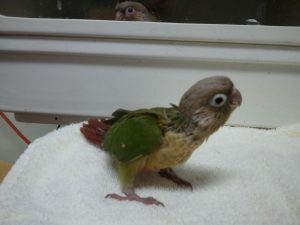 They didn’t sell it where I got Jak, and she was my first conure. I know they sold it at the shop where I got Koi and Idris, but I don’t think they were feeding it to their birds. Maybe I’d asked my veterinarian? Vets are cool like that. They are also getting Nutriberries. I feed Harrison’s to my conures, but my parents feed Zupreem. They have had their pair almost as long as I’ve had Jak, and have only had to deal with eggs once. Their female laid three. How fortunate. My girls are also ridiculously tamed compared to their cousins. My parents’ pair will call you over to talk to you, but you best not come within 2 feet of them, or they will flee.